Consider the following: Through careful observation, you may have learned a number of things about William Sanford "Bill" Nye over the years—that he’s a famously funny scientist, educator, and author, perhaps, or that his 2013 stint on Dancing With The Stars ended with injury and a final performance to “Get Lucky” that left judges lukewarm. His public appearances and the show Bill Nye the Science Guy are just the tip of the iceberg, though. Here are a few facts that even the most Nye-hard fans might not know. 1. HIS MOTHER WAS A WORLD WAR II CODEBREAKER AND A SCIENCE WHIZ. Jacqueline Jenkins-Nye was finishing up her psychology degree at Goucher College in 1942 when she and several other young women were called to the dean’s office for a hush-hush meeting. The U.S. Secretary of War was scouring women’s colleges “seeking their best and brightest for a project so secret that none of the participants was allowed to know its purpose,” according to The Baltimore Sun. After graduation, Jenkins joined an elite group of people whose work as cryptanalysts, or codebreakers, helped finally crack the Japanese and German militaries’ very crafty communication codes. "She taught me how to cook—and how to make the famous family salad dressing that her grandmother taught her to make, which was pure chemistry. She taught me how to sew, even. To this day, I still own a sewing machine. And to this day, I can still hear her chanting in my ear: 'Sit up straight! Shoulders back! Now train, train, train! Do it till you get it right!'" 2. HE WENT TO SIDWELL FRIENDS SCHOOL IN HIS HOMETOWN OF WASHINGTON, D.C. In an opinion essay he wrote for the Huffington Post in 2009, Nye said that he attended D.C.’s Sidwell Friends School—a private Quaker institution where Chelsea Clinton, Sasha and Malia Obama, and many other politicians' kids have studied—for middle and high school. Nye attended Sidwell thanks to a partial scholarship and his parents’ determination, which helped him transfer from a public school where classrooms were packed, spitballs flew freely, and bullies harassed bussed-in students from nearby schools that “were really not separate, and most especially not equal,” Nye wrote. While at Cornell University, Nye took an Astronomy class taught by Carl Sagan, and the older man’s enthusiasm and penchant for innovation helped ignite Nye’s lifelong charge to achieve the same. 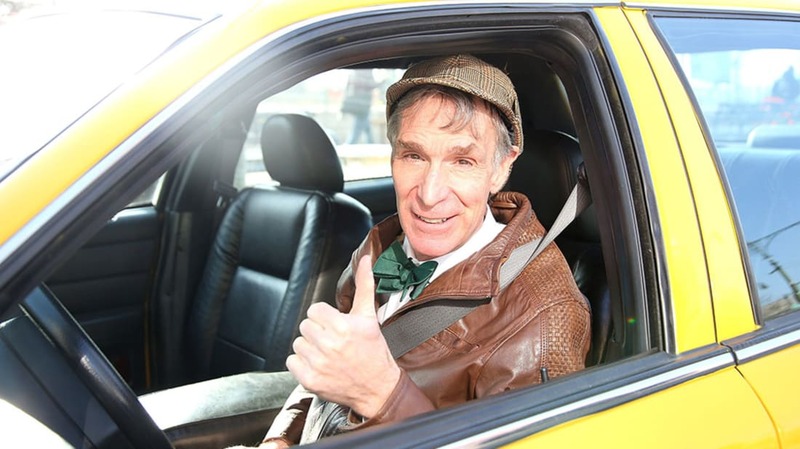 At a reunion years later, Nye also mentioned his TV plans to Sagan, and received good, matter-of-fact advice from his former professor that would help make Bill Nye the Science Guy such a success: "Focus on pure science. Kids resonate to pure science." 4. ... AND FOLLOWED IN HIS FOOTSTEPS. 5. HE APPLIED REPEATEDLY TO BE AN ASTRONAUT. 6. HE'S MADE HIS MARK ON MARS, THOUGH. Nye was part of a team that designed the MarsDial, a tool installed on the Spirit, Opportunity, and Curiosity rovers that helps calibrate color in photos taken of the planet from inside its thinner, different-colored atmosphere. 7. NYE HAS A NEED FOR SPEED. "I really like to go fast,” Nye told the St. Petersburg Times, “but you know how many speeding tickets I have? That's right. Zero. A car is a weapon. If you have a loaded gun you have to treat it with respect. The same is true of a car, and I'm not saying that I won't get a speeding ticket this afternoon, I'm not saying that I'm some kind of driving genius, but I do respect it and understand how fabulously dangerous it is." Aside from his love of speed, Nye is a huge proponent of electric vehicles, and has even called for NASCAR to get on Team Green and use electric whips instead of gas-guzzlers. 8. HIS HIT TV SHOW WAS BASED ON A COMEDY SKETCH. Prior to making a splash with Bill Nye the Science Guy in 1993, Nye was doing his quirky-yet-educational experiments on the comedy show Almost Live, which aired on Seattle NBC affiliate KING-TV from 1984 to 1999. In one 1990 Almost Alive episode (above), he uses the studio’s less-than-professional-grade equipment (or, as Nye puts it, its “Mickey-Mouse Science Guy” setup) to tease chemistry lessons out of glasses of Coca Cola for the benefit of the show’s live audience and the scene’s less-than-impressed host. In addition to being the show’s go-to science expert, he also filled out the heroic role of “Speed Walker” on the program. 9. THE RENOWNED SCIENTIST IS “KOOKY” FOR STEVE MARTIN. In addition to his shenanigans on TV, Nye’s comedic resume includes a decade of performing stand-up, and he’s quick to cite his “hero” Steve Martin as a major influence. "I'm kooky for Steve," he told the St. Petersburg Times in 1999. "I hope to meet him someday. I wrote him a note, but I never heard back from him: ‘Dear Steve, I'm Bill Nye. I owe my career to you. I'd like to buy you lunch sometime. Your friend, Bill.' … I'm sure he's like, ‘This guy's insane. He's a stalker.'" Before he became famous as the Science Guy, Nye even won a Steve Martin lookalike contest. From 1991 to 1992, Nye helped organize live-action science experiments on Back to the Future: The Animated Series as Christopher Lloyd’s (nonspeaking) onscreen assistant. 11. ... AND HAD A HAND IN BATTLEBOTS, NUMB3RS, AND STARGATE: ATLANTIS. Given his range of talents, it might not be too surprising that Nye has played a number of roles in bringing science-friendly programming to the small screen. From 2000 to 2002, he served as the technical expert on the robot fighting show BattleBots, while a math education lecture he gave helped inspire the detective show Numb3rs and led to his recurring cameos on it. In his free time, he also produced Solving for X, an algebra-teaching series of DVDs, and even showed up in an episode of Stargate: Atlantis to give one character a little nerd-style bullying with the help of Neil deGrasse Tyson. 12. HE’S BEEN CAMPAIGNING FOR BETTER EDUCATION FOR DECADES. Nye promotes education shape-ups and the importance of STEM (science, technology, engineering, and mathematics) learning any chance he gets—and he makes sure there are plenty. In addition to speaking and writing widely on the topics, he’s a frequent speaker at conferences of the National Science Teachers Association. In 2000, shortly after a study ranking the world's schools was released, Nye told audiences that "If the U.S. was ranked 17th in the world in track and field or in Olympic swimming [instead of science and math abilities among eighth-graders], there would be a tremendous outcry ... Imagine the money that would be spent to fix that." 13. HE AND ED BEGLEY JR. ONCE ENGAGED IN A BATTLE TO HAVE THE GREENEST HOUSE. Nye has put a lot of time and thought into making his house as eco-friendly as possible, and when they lived next door to each other, he and actor/environmentalist Ed Begley, Jr. enjoyed some friendly competition where minimized footprints were concerned. In 2008, Nye was winning: Solar panels and various home upgrades meant his house put more energy back into his local power grid than it took out. Then, in late 2015, Begley moved. It’s difficult to determine who ultimately won their green-off contest, but when he moved, Begley had nine kilowatts of solar panels on his roof to Nye’s four, because, as Nye told National Geographic, “a different neighbor’s house blocked the sun at certain times of the day. I’ve thought about cutting that part of her house down,” he said, laughing, "but it probably wouldn’t be the most neighborly thing." 14. HIS COMFORT FOOD IS ONE SLICE OF BACON. All photos courtesy of Getty Images unless otherwise noted.